On Thursday evening, I played an hour and a half of Kingdom Hearts III (KH3). I wielded my Keyblade against a Titan on Olympus. I fought in battle as a robot in Toy Story world. I hung out with my besties Sora, Donald, and Mickey again, and they've never looked better. And they should look better, because Kingdom Hearts III is the first new game in the main, numbered video game series since 2005. Thirteen years of progress in game development appears to have made KH3 a title that will have visuals to match the compelling story. This game will wrap the Dark Seeker Saga that began in the first Kingdom Hearts. The battle of light vs. dark/good vs. evil in the Disney-meets-Final Fantasy world is coming to an end with resolutions for the hero Sora, the villain Xehanort, and everyone in between. 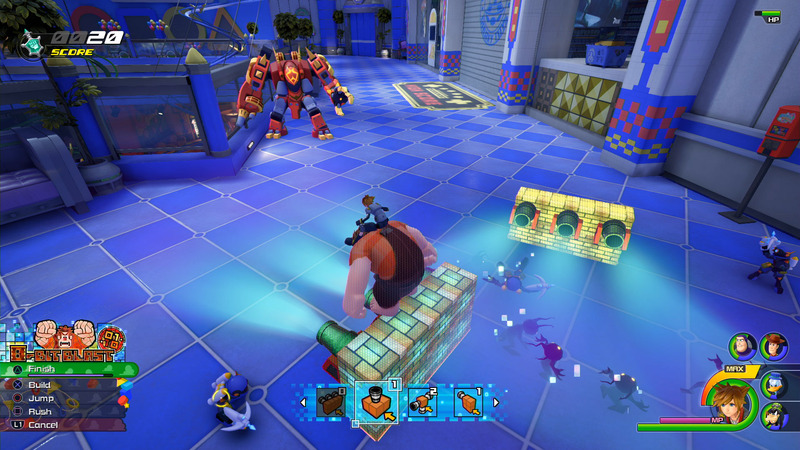 The hands-on preview didn't delve into plot points, with the exception an Organization XIII member appearing in the Toy Story world; the demo was all about experiencing the changes in gameplay. Textures, lighting, interactivity with the environment around you—all of these are better in KH3. I ran around Andy's room and Galaxy Toys, leaping on as many surfaces as possible. You can roll around on balls, knock items off shelves, and jump on practically anything (more on that in a minute). Taking the time to explore is rewarding because of the way the environments react to you. The characters look sharper, more detailed. I've noted this in KH3 trailers, but it's more evident during gameplay. The toy versions of Sora, Donald, and Goofy have a plastic, porous texture. Hamm has scratches and faded spots to show wear and tear. (What is Andy doing to his toys?!) Even the backgrounds have character: climbing around inside the vents of Galaxy Toys feels grimy, and the rain-covered surfaces on Olympus feel slippery. Lighting is more careful and directed this time around, too. During a panel before the demo, Kingdom Hearts III co-director Tai Yasue noted the light was built into the textures in the past. Now, they shine different light sources into scenes to give them a more realistic look. He also pointed out the worlds are more populated with background characters, a statement supported with a shot of Corona from the Tangled world where citizens occupied the space around the town square naturally. As noted, you can jump onto most objects you encounter. And if you just move forward, Sora sort of automatically adjusts, maneuvering over or around obstructions with ease, and even running up walls. The vertical aspect of movement is especially emphasized in Olympus, where I dashed up sheer rock faces and cliffs to get to the Rock Titan, dodging to the left and right to avoid boulders falling over the edge. To say it's easier to move isn't quite the right way to describe it. Movement's more intuitive and fluid. It's worth taking a few minutes to race around and see what you can do. Combat is where you'll find the biggest improvements and changes in Kingdom Hearts III, and I'm here for it. The prologue, Kingdom Hearts 0.2 Birth by Sleep – A fragmentary passage, has the closest combat system to what I experimented with in KH3, so I'd recommend playing it before the new game's release as a base—KH3 goes above and beyond it, though. Link is the new word for Summons. You can still call upon your pals, but now they have a different name and more detailed controls. I linked up with The Little Mermaid's Ariel using “Lagoon” and Wreck-It Ralph's Ralph using “8 Bit.” A new addition to the Kingdom Hearts franchise, Ralph can build blockades and then wreck them. You can use his help to block in Heartless or split off a section of the battlefield, or you can tap into his brute strength to rush your enemies. Ariel, on the other hand, is more elegant. You can use her watery form to dive into Heartless or splash them, and her finishing move is like a small version of the Bellagio water fountains in Las Vegas that you can orchestrate for maximum effect. I'm going to need more gameplay time to nail the nuance of using the Links in the most optimal way and to appreciate the graphics and attention to detail. Ralph, for example, appears by coming out of the Fix-It Felix Jr. game. I'm not much of a magic user, so I rely on the strength of my Keyblade for combat. Learning what combos a specific Keyblade can do and what its advantages are has been one of my favorite parts of past games, but I've found it frustrating to only be able to use a single blade in battle. Also, I'm enamored with all the designs and I don't like to pick favorites because then I don't see them all. But now, you can switch between Keyblades during combat. I'm a button masher, so seamlessly transitioning between Keyblades is something I need to work on, but noting the contrasts between what the Toy Story, Tangled, and Monsters, Inc. Keyblades can do incentivized me to become better. Varying attacks and animations makes combat more engaging, less repetitive. I found myself excited about fighting every pack of Heartless instead of feeling, “Ugh, again?” because I wanted to try other techniques. Summoning Attractions also contributes to making battles more varied and unique. As a Disney Parks ride or die, my heart leaped when I called the Mad Tea Cups, Big Magic Mountain, and Pirate Ship into action. They're stylized as if they're part of the glowing Main Street Electrical Parade, which gives them all a cohesive aesthetic despite their distinct characteristics. Here, like in other areas of the game, the focus is on interactivity. The attractions don't operate independently; you ride in them and direct them to attack your enemies. The visuals are a little distracting; the screen was so crowded with activity—like cascading water and fireworks—that I found the attractions hard to control and aim, but it's likely a matter of getting used to this style of gameplay. A few other welcome changes: it doesn't appear that you have to swap out members of your party. Woody and Buzz joined the group as additions, not replacements. Bigger party sizes means you don't have to miss out on leveling up Donald and Goofy, and you have more firepower on your side. Additionally, teaming up with different party members leads to various combos and effects. All of that in concert with the alterations listed above and other additions like being able to jump into robot suits in Galaxy Toys makes me enthusiastic about combat in KH3. And I'm usually a player who gets stressed out about combat. Square Enix will be announcing the specific 2018 release date for Kingdom Hearts III early in June, likely at E3. Amy Ratcliffe is a Managing Editor for Nerdist. Follow her on Twitter and keep up with her Disney food adventures on Instagram. God of War's new photo mode is too perfect. Mega Man games are getting rereleased on cartridges. Watch the trailer for Red Dead Redemption 2.